Andre Rieu Love In Venice DVD from DVDLand. Fans of the most successful violinist of modern times can look forward to a popular selection of the most well-known Italian melodies, including O sole mio, Volare, Azzurro, Santa Lucia, Tiritomba; the famous barcarole by Jacques Offenbach, the Lagoon Waltz by Johann Strauss as well as the Toselli Serenade. An exclusive highlight on the new DVD will be three of André Rieu's own compositions, released for the first time, all of which are dedicated to Venice! 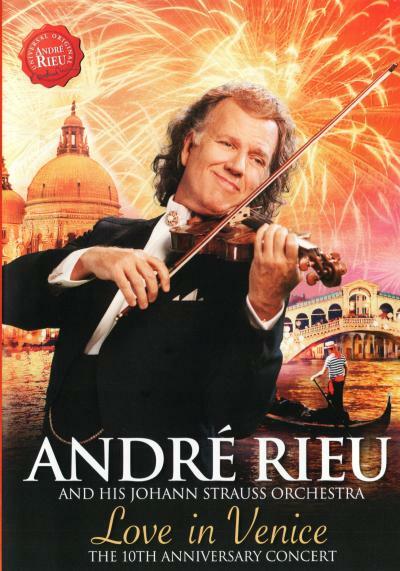 Andre Rieu's Love In Venice DVD is a must for any Andre Rieu fan. Click the button below to add the ANDRE RIEU - LOVE IN VENICE to your wish list.